Universal Pictures and Illumination Entertainment's worldwide blockbuster, Despicable Me, delighted audiences around the globe in 2010, grossing more than $540 million and becoming the 10th-biggest animated motion picture in U.S. history. In Summer 2013, get ready for more minion madness in Despicable Me 2. Chris Meledandri and his acclaimed filmmaking team create an all-new comedy animated adventure featuring the return of Gru (Steve Carell), the girls, the unpredictably hilarious minions...and a host of new and outrageously funny characters. Download Despicable Me 2 in Digital HD from the iTunes store. Despicable Me 2 images are © Universal Pictures. All Rights Reserved. They're back again those funny characters that make the animated film Despicable Me 2 a hilarious situation comedy that delivers the laughter. I'm speaking of the pill shaped ‘work a bee's' for the villain Gru called Minions. In this sequel they dominate the screen and give most of the audience what they came for, a lot of chuckles. My favorite among the humans Agnes still remains the shining star and she's as adorable as ever. This time we find Gru (voice Steve Carell) living an enjoyable life among his Minions and adopted children Margo (voice Miranda Cosgrove), Edith (voice Dana Gaier) and Agnes (voice Elsie Fisher). He's the perfect father and really loves his new life even though teen Margo has found an interest in boys. One day Gru gets visited by Lucy Wilde (voice Kristen Wiig) from the Anti Villain League and gets kidnapped by her. He's taken to their headquarters and offered a job to find the culprit who stole a special serum. It's a liquid that changes living creatures into raving lunatics. In command of these hairy monsters a super villain could take over the world. Having no choice but to take the job he finds himself making cupcakes at a shop in the Mall where the mastermind of the devious plot to take over the world has a restaurant. In the meantime Margo falls for the dashing young Antonio (voice Moises Arias) the son of El Macho the owner of a Mexican Restaurant in the mall. Torn between stopping Margo's love life and saving the world, Gru sets out to do both. While there is a lot of the same old Minion tom foolery, another deadline to save the world and a lot of family to develop, Despicable Me 2 still delivers a fun filled hit with the addition of some new fun characters. The character Lucy Wilde reminds me of the Progressive Auto Insurance lady in their commercials with her ambivalent personality and facial expressions. Partnering up with Gru Lucy shows off some very unique abilities that help him fight the baddies. She's a Loony Toon but one that's a real match for Gru as a love interest. In addition there's El Macho voiced by Benjamin Bratt who's the main subject of the investigation and makes his debut on the big screen as a tough looking suspect. Smart and boisterous, he's a former villain who has decided to taper off from his past and settle down as the proud father of Antonio. When the Mexican Restaurateur has a special Cinco de Mayo party for the mall, it turns into an opportunity for Gru and Lucy to do some investigating. There's even a voice appearance of Steve Coogan as Silas Ramsbottom the head of the Anti Villain League. Pompous and full of himself he's a great giggle maker for the Minions. In addition to the excellent animation the musical score is brilliant. I found myself singing along in my head to "I Swear" and "YMCA" and laughing when the theme to Halloween was played. The soundtrack also includes "Fun Fun Fun" written and performed by Pharrell Williams, "Jamming" Written by Bob Marley, "Scream" performed by CeeLo Green, "Don't Stop the Party" performed by Pitbull and more. 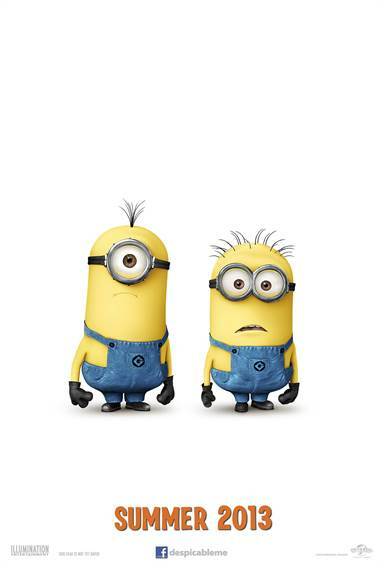 Despicable Me 2 has been rated PG for rude humor and mild action. The 3D version gets my approval with a lot coming at you from all directions, even by way of the audience. Please note that I recommend choosing a theater that has been kept up well and features the film on digital screens that are large enough to accommodate 3D. At the screening of the film that I attended, the heads of characters were cut off as well as their lower extremities at times so when 3D action was popping at you most of it was not visible. If you remember the Minions blowing the Birthday favors in Despicable Me 1 you'll know how they came out into the audience, no dice if the screen can't handle it. Just, saying. Normally fun, but i love i.